The Walking Dead has always been a show about the human aspect of the apocalypse. While it may have stumbled quite a lot in this area during its run, it has always been a soap-opera set in the zombie apocalypse – and that is a good thing. Rather than following George Romero, and turning the undead into a political statement, Robert Kirkman and team have always focused on how people react when faced with the end of the world. “Indifference” embraces this as it continues to explore of the most interesting dynamics this show has seen in a long time, and despite a less than stellar sub-plot, provides one of the slower, but probably the best episode of the season so far. Lets get the big point out of the way – I am glad they made Carol the culprit of the Dave and Karen killings and not Lizzie. It brings much more depth to her character, and unless we find out later on that Carol was covering for her, provides a much more plausible scenario. That’s not to say that their conversation at the beginning of the episode wasn’t any less dubious – Lizzie’s mental state is obviously deteriorating, and an inability to understand that the walkers are in fact dead is troubling. 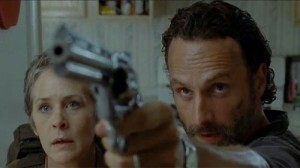 Now that Carol’s out of the picture, it’s not looking good for anyone who is going to be shacked up with her. Yes, I do believe this is goodbye for Carol, which is a shame. Her character has been one of the strongest on the show for quite some time now, and Melissa McBride has been carrying the bad guy torch in absence of any typical villain figure within the show. That’s not to say she has become a villain herself, in fact she could not be further from it. She has become the yin to Rick’s yang, becoming an embodiment of what happens when the leader drops empathy in favour of a more realist approach, as shown when she was happy to put the new kids to good use. She made a choice in killing Karen and David, and had she succeeded in her intent would we be singing her praises? Or would we have ended up in the same position we are in now? This doesn’t mean that Rick’s decision to exile her was any more right. Both these characters acted in an ultimate form of leadership, and Rick’s choice only highlighted the hypocrisy further. Neither character consulted with the others in their incredibly major decisions – and Rick punishing Carol in this manner is hypocritical, but ultimately incredibly human. People act act on emotions rather than the facts, and although Rick may be hiding from his leadership, he still makes leadership decisions. Carol also falls victim to this, in her insistence for Lizzie to not call her “mom” only to plead with Rick to let her take them with her is contradictory but believable. This show has been trying to accomplish this a few times with both Lori and Andrea, but only now have they really succeeded. Daryl’s expedition fared less successfully however, as it really couldn’t live up to the same standards as the other story. Tyreese began acting a little melodramatic, but in the end was willing to let the anger go – which is welcome if not a little rushed. Letting go was a key point throughout this story, as Michonne was able to realise that her hunt for the Governor wasn’t doing her any favours. Stookey’s alcoholism was brought up again, and his standoff with Daryl was good, but the rest of this storyline just felt like it carried a lot less impact than the more major events happening to the other group. “Indifference” was thought provoking and incredibly well written for the most part. Despite a B-story that paled in comparison to the main event, it was a fantastic episode. Saying goodbye to Carol for now will be tough, but Rick has made great strides in characterisation this season, and if this episode is any indication hopefully it won’t prove to be that major a loss. Sorry about the incredibly late review again. Life gets in the way, but I will be on a more punctual time schedule from now on. It’ll be sad to see Carol go, as Melissa McBride has really held her own so far this season. She’ll be back, but I hope it will be sooner rather than later. Keeping the events focused on only the groups outside the prison was a smart choice, as precious screen time has been spread too thin so far this season. That couple was much too friendly, and her leg was very cleanly severed. I have a feeling Rick will be seeing his watch again very soon. Infected zombies are an awesome way of adding extra danger to the routine of putting them down.